One day Jesus sat by the treasury watching people pay their tithing. The wealthy came and donated large amounts of money and many were probably impressed by the size of their donations. However, the person who attracted the Savior’s attention was not the wealthy with their large donations, but a widow with very little money, who donated only two mites, a very small amount of money. He was so impressed by her he called his disciples over to see her. He told them the others had donated, but she had given everything and that in reality, she had given far more than the wealthy had. Read the story of the widow’s mite in the Bible. When God places a value on what we have given, he looks at how much it really cost us to give it. A fair tithe, which constitutes ten percent according to the Bible, is a larger sacrifice for the poor than for the rich. For that reason, God provides greater blessings to those who make the greatest sacrifices. Bring ye all the tithes into the storehouse, that there may be meat in mine house, and prove me now herewith, saith the Lord of hosts, if I will not open you the windows of heaven, and pour you out a blessing, that there shall not be room enough to receive it (Malachi 3:10). It should be noted this scripture does not mention money. Nowhere does the Bible promise material wealth if we pay our tithing. Blessings from God take many forms, most of them spiritual. While some have experienced miracles in which they paid tithing and were financially rewarded, many other pay it and receive other miracles instead. Those miracles are frequently of greater worth than money. Tithing is, of course, essential for the running of God’s church. In today’s world, it costs money to build meetinghouse and equip them with the necessary supplies. It takes money to provide a missionary program, to care for the poor, and to do other services necessary for the running of a religious program. While Mormons do not receive salaries for their church work—even bishops (ministers) work for free—there are some who must be paid, such as secretaries and custodians. 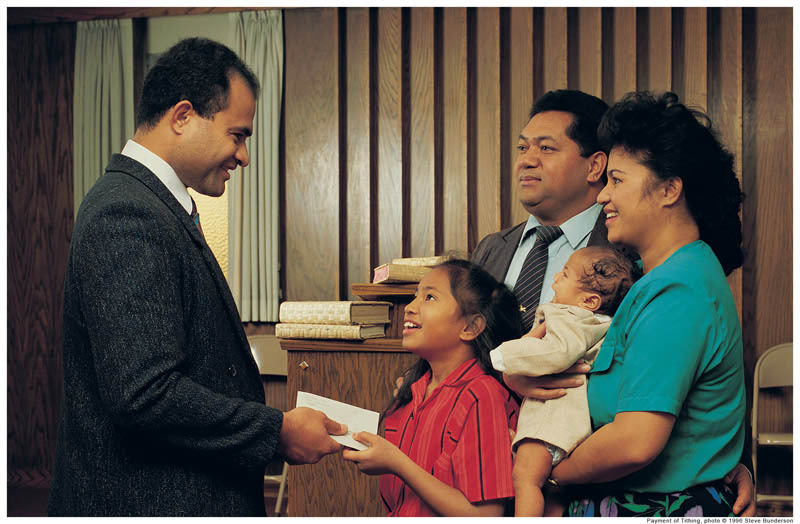 Learn: what do Mormons use tithing for? The word “tithe” means ten percent and that is the amount God asks us to give. While the money assists the church, it is largely given for the assistance of its members. Mormons (members of The Church of Jesus Christ of Latter-day Saints) believe that tithing teaches us to have faith, to put spiritual things before worldly things, helps us learn to trust God, prevents greed, and promotes self-sufficiency. Mormons pay tithing on their increase (earnings) and it is left to the individual to decide of that refers to net or gross and what constitutes income. They are not required to submit proof of income. They simply pay their tithing and report at the end of the year whether or not they consider themselves full-tithe payers. Tithing is paid privately. Mormons fill out a donation slip and hand it to one of three church leaders at any time during the church meetings. No plate is passed during services. Church donations are audited regularly by independent auditors. Jesus often taught that we must be willing to make financial sacrifices for the gospel. In the New Testament, a wealthy young man asked what he needed to do to be saved. Jesus listed a number of commandments, but the young man said he already did those things. Jesus then invited him to give everything he owned to the poor. This was more commitment to the gospel than the young man was willing to make and he turned away. While today Jesus might not ask us to give up everything, our willingness to pay tithes and offerings are a reflection of how our commitment to worldly things compares to our commitment to spiritual things. Tithing also helps us learn to trust God. Even people with average income might find it difficult to give away ten percent because they feel they need that money to improve their own lives. When they pay it anyway, they place their trust in God to provide the essentials of life and switch their focus to things of greater eternal significance. The lesson of the widow’s mite is that it isn’t how much you give—it’s how great your commitment to eternal principles really is. The late Terrie Lynn Bittner—beloved wife, mother, grandmother, and friend—was the author of two homeschooling books and numerous articles, including several that appeared in Latter-day Saint magazines. She became a member of the Church at the age of 17 and began sharing her faith online in 1992. Why Should I Trust the Wisdom of God?